I keep getting kale in my farm share. Unfortunately, I loatheeeeeee the stuff. Like most people loathe Twilight. So, every week I'm trying to find some redeeming quality in the stuff. I hate it's flavor, I hate it's texture, I hate the stringy leafy bits and the feel of the leaves on my hands. Yeah, it runs deep. In desperation I decided to invoke the Rinn of Rinn past-the poor sucker who got stuck making pesto at Java Joe's all the time. I finally found a way to not only eat it, but enjoy it. By mixing it with loads of fatty deliciousness. 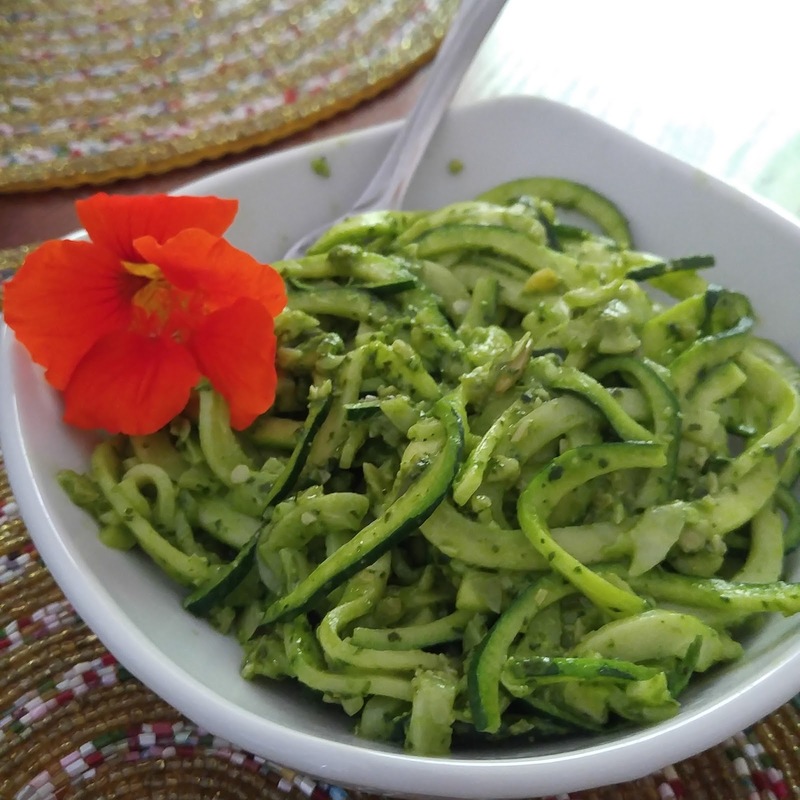 I almost burned the motor out on my blender, and realized it's time to invest in a real food processor, but it's delicious on zoodles. I used 1 Tbsp. to 6 oz. of zucchini from the same farm share in this pic (140 calories). Just tossed them together and heated them on the stove until warm and creamy. The flower is edible too. Nasturtium from my edible flower garden. Wash kale, remove woody stems, and chop up. A bit at a time, combine everything in your food processor or blender until smooth, adding oil as needed to keep things moving. Store in sterile glass. I recommend the Ball jam-type containers. This recipe freezes really well, and seems to keep in the fridge for several weeks. A serving is 1 Tbsp. Makes approximately 28 servings at 126 calories each.